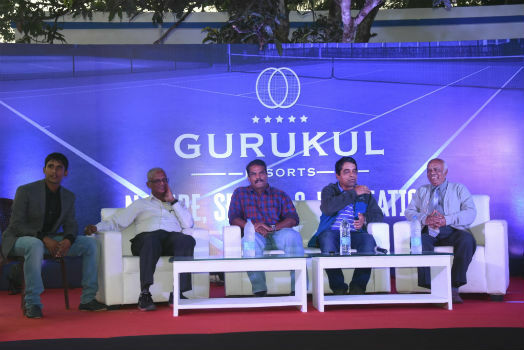 Report by Dipankaer Piyush Pritam, Bhubaneswar: Gurukul Resorts, the first Lawn Tennis based resort in the country was inaugurated by Shri MadhusudanPadhi IAS, Secretary Odisha Tennis Association & Transport Commissioner, Govt. 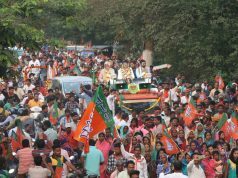 of Odisha on 27th of December 2017 at Mendhasal. The resort, a dream project for one of the most leading tennis players from the state and also the first ever ATP Player from Odisha, Chinmay Pradhan, is located on the outskirts of the capital city in Mendhasal village, 12 kms away from Bhubaneswar. Spread over an area of 1.45 acres and well planted with lovely coconut and mango trees with a little pond around the corner adding to its beauty, the resort has three fenced International standard tennis courts with floodlights, 10 cottage rooms, restaurant, cafeteria, open gym and a sitting gallery attached to it. 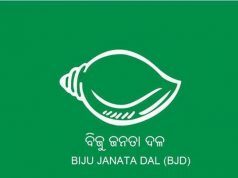 Chinmay Pradhan, who is also the proprietor of the project, has also received support from his coach, Santosh Kumar Mallick who is also a well-known name in Odisha Tennis, for the project. 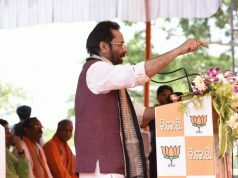 The idea behind setting up the resort is to develop Odisha as a National Tennis Hub for development of tennis in the state in the days to come. Lawn Tennis is an individual game in which the players come for the tournaments (ITF Futures international or AITA National), which ae ranking tournaments. Players participate in these tournaments for ranking points and they also bear all their expenses including lodging and boarding for such tournaments. In India many tournaments are continuously conducted in different states but at different locations which makes it difficult for the players as they don’t get accommodation facilities at the venue, most of the times. Often, they have to put up at places, which are fare away from the venue. Such a problem not only increases the expenses for the players but also makes it hectic for them. Gurukul Resorts, will therefore, ensure to cater to all the essential needs of a player participant at a very reasonable price. Since Mendhasal has already witnessed national level tennis tournaments earlier, it will serve as the perfect location for the first tennis-based resort in the state and the country. Interestingly, many young children from the village who had never heard of a sport called tennis have already performed exceedingly well at state level tournaments under the guidance of coach Santosh Kumar Mallick and inspired by their idol Chinmay Pradhan. Five such kids from the village were also felicitated by the Chief Guest for their commendable performance during the event, which was graced by many ATP Pro Circuit professionals and National Champions all across the country. Extremely pleased with the initiative, Shri MadhusudanPadhi said the the resort will be a milestone in the development of tennis in Odisha as it will give players, especially those from Odisha, a chance to participate in more numbers of AITA tournaments which will help in the overall development of the game.